Mac iPhone Photo to Computer Transfer - Transfer Photo, Camera Roll from iPhone to Mac. Transfer Photo and Camera Roll to Mac computer. 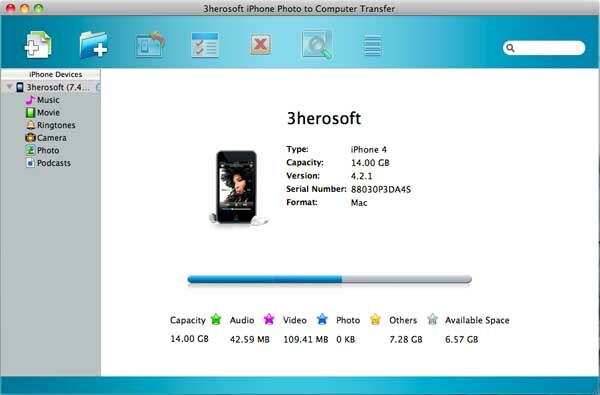 3herosoft iPhone Photo to Mac Transfer is the very practical iPhone Photo transfer software that specially designed for iPhone users. It allows you to transfer Photo, Camera Roll (photo and video from iPhone to Mac for backup in case your Photos or camera videos are lost or damaged. And now iPhone Photo to Computer Transfer for Mac can fully support the latest updates on Apple devices such as: iOS 8 and iTunes 12. and you can import music, video, podcast to iPhone library and transfer all iPhone files to Mac local for backup. If you get your iPhone upgrade to iOS 5.0, transfer any formats of Photo to iPhone library without the help of iTunes. You can browse file information and open iOS device as protable hard disc, even orgnize iPhone files (rename delete, move, paste, create, etc.). It can support all types of iPhone including iPhone 3, iPhone 4, iPhone 5, iPhone 5S/5C, iPhone 6/6 Plus, etc. Transfer photos form Mac to iPhone 3, iPhone 4, iPhone 5, iPhone 5S/5C, iPhone 6/6 Plus after you upgrade iOS 5.0 or above. Copy and backup iPhone music/video/photo/camera roll/podcast to Mac, even synn them to iTunes. This Mac iPhone Photo Transfer can copy and transfer music/video/podcast/ringtone to iPhone library without using iTunes, much easier than iTunes! All playlists in iPhone library can be allowed to transfer to Mac local or sync them to iTunes library, you can sync to any Apple iOS device in quick way. Well keep high compatible with latest updates, iOS 8 and iTunes 12. You can use iPhone as portable disc, copy, store, move, delete, create any files as your own, don't worry the iPhon files are lost and damaged. You can easily search for any iPhone files in the Quick Search bar and Filter files like iTunes to locate by different catagories. Convenient to find out certain files you want to check. After connecting iPhone/iPhone 3/iPhone 4/iPhone 5/iPhone 6 to Mac, the interface of the program will display the device info automatically including Type, Capacity, Version, Serial Number and Format. How to copy iPhone photos to Mac for viewing with high quality?